Exclusive for Cassette Store Day 2015. Cassette with a 6-panel J-card and a black liner cassette shell. It's been nearly a decade since the world was treated to new official music from celebrated rapper and pop-culture icon, Method Man. 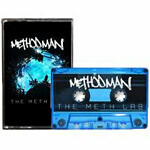 The Meth Lab was recorded in Staten Island and features lifelong cohorts and SI residents Redman, Raekwon, Hanz On, Streetlife, and Inspectah Deck, along with Uncle Murda, Cory Gunz, and Mack Wilds. The album features production from Ron Browz, Allah Mathematics, J57, and 4th Disciple and is exactly what his fans have been craving -- 17 new and gritty tracks dripping with Mef's lyrically imaginative, deliberate and laid-back style.